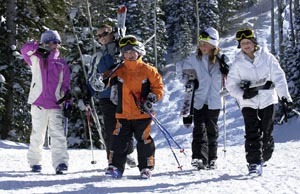 Every Ski NH downhill and cross country ski area is contributing one free lift ticket, for your fourth or fifth grader. Every area is also including one additional offer; these include savings on first-time and beginner lessons and equipment rentals for your fourth or fifth grader, savings on lift tickets and trail passes for parents and siblings, and more. Click here to learn more and get your passbook. Get complete info and forms for fourth grade Snowsports Passport. Get complete info and forms for fifth grade Snowsports Passport.